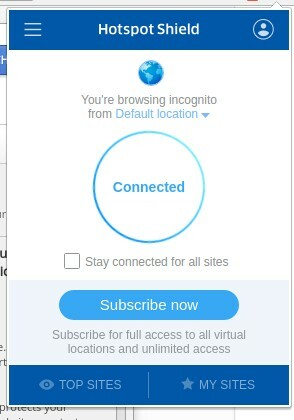 You must be already aware of various VPN Chrome extensions to unblock sites and encrypt your connection to a web page. Do you know what the best VPN Chrome extensions among them are? 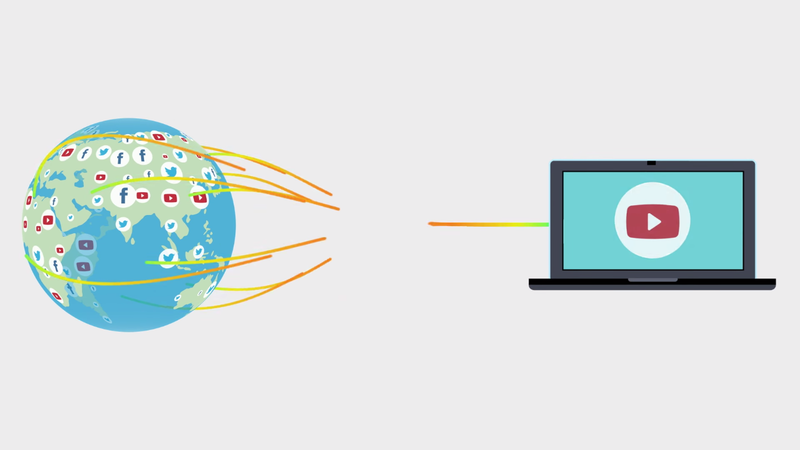 Do you know how a VPN works? How is a VPN Chrome extension different from the standalone application for Windows, Mac & Linux? Fret not; we will provide you a brief answer to each of the questions mentioned above. If you are already aware of what a VPN is and how it works, you can directly jump to the list of best VPN chrome extensions. What does VPN do exactly? VPN stands for Virtual Private Network. In general terms, the VPN routes your connection through its secure network with a different online identity. In a nutshell, it encrypts your Internet connection no matter where you are and what you are connected to (home network, public Wi-Fi hotspot, or mobile data) from the hackers, government, and ISPs. Now, you know that a VPN secures your connection to the Internet. 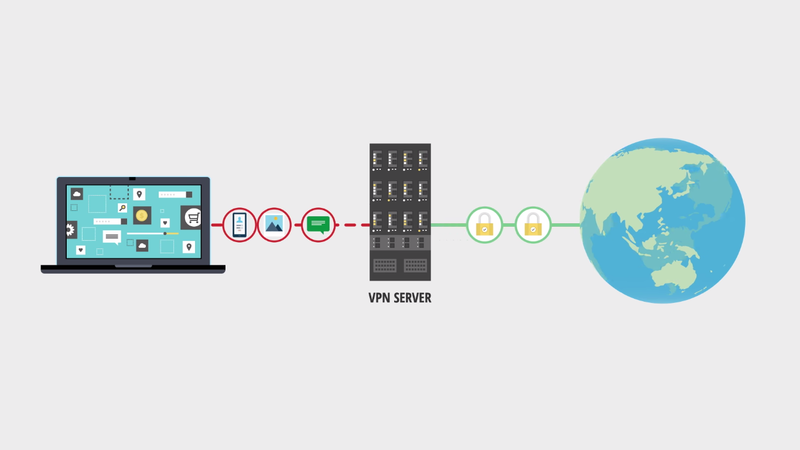 You must be wondering – “Why do I need a VPN when I am connected to my home network?“. Well, a VPN is not meant just for securing your connection when connected to public WiFi hotspots, but specifically to encrypt your connection and keep your online activity hidden from your Internet Service Provider. Your ISP normally monitors your activity on what you do and what you access. It controls your access to web resources and imposes content blocking, geological restrictions, and Internet censorships. So, when you set up a Virtual Private Network using a chrome extension, your ISP would be able to observe only some gibberish information about your browsing activities. In a nutshell, it masks your connection to enhance your security against mass surveillance. However, do note that using a VPN does not make you anonymous but it just enhances your online privacy to a greater extent. Even if you are using a VPN, you will still be vulnerable to targeted surveillance. In addition, we recommend you checking out the 10 Myths on Zero-logging & Anonymity debunked by VyprVPN to get a detailed idea of how a VPN works and does it really keep your identity anonymous or just safe? Note: A VPN Chrome extension does not encrypt your computer’s Internet connection (only a standalone application for Windows/Mac can do that). So, it only secures your connection while you are using your Google Chrome browser to access resources. Zenmate for Chrome is one of the most desired VPN Chrome extension. It is a free VPN chrome extension which also offers a pro solution to it. If you just signed up for an account in order to use it for free, only 4 of the server locations would be accessible to you (United States, Hong Kong, Romania, and Germany). 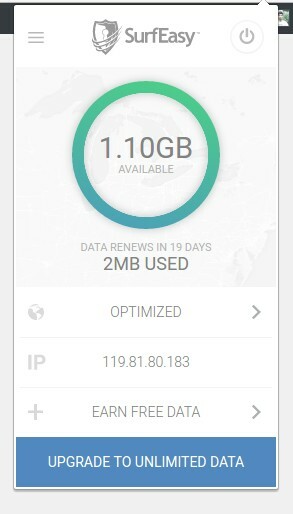 Overall, there are not many server locations with ZenMate VPN, but regardless of what server you choose, your Internet speed would not be affected by much (not something noticeable). 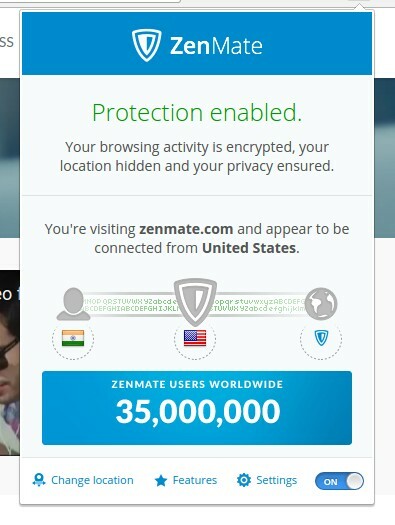 If you enjoy using the Zenmate free VPN Chrome extension, you can upgrade it to the premium plan (at $59.99 per year) which would equip you with some additional functionalities to switch between server locations automatically according to what you prefer on every individual site (your favorite ones). Also, you get access to two new features – Malware Blocking & Tracking protection – which would make your browsing experience even more secure. DotVPN Chrome Extension DotVPN is yet another popular VPN Chrome extension. It provides a free version and a pro version to it as well. 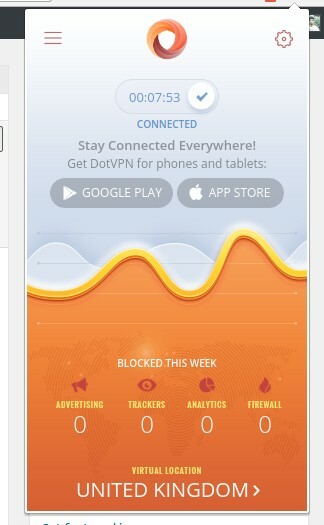 With the free version activated, DotVPN gives you an unlimited data usage along with a cloud firewall protection. DotVPN’s free version is suitable for common Internet users who simply want to unblock sites and achieve an extra layer of online privacy. If you are a power Internet user who wants to get the most out of a VPN, you can opt for DotVPN’s premium plan ($2.99 per month) which allows you higher Internet data transfer speeds, a 4096-bit encryption key, zero content restrictions (not sure! ), smooth video streaming, and audio streaming. Gom VPN chrome extension is an easy-to-use extension for users who do not want to configure a service in order to use it. It is a one-click solution for the users who are looking to enhance their online privacy and unblocking sites at the same time. Hola VPN chrome extension is completely a free solution for users. It offers you many server locations to choose from and does not put a significant impact on your Internet speed. Hola built a peer-to-peer overlay network for HTTP, which securely routes the sites you choose through other Hola users’ devices and not through expensive servers. Hola never takes up valuable resources from these users, because it only uses a user as a proxy if that user’s device is completely idle (meaning that the device is connected to electric power and not on battery, no mouse or keyboard activity is detected, and the device is connected to the local network or WiFi (not on cellular). This makes Hola the first VPN service that has no underlying operational costs. Well, it is a brilliant method to keep Hola VPN free for life utilizing the community in the way mentioned above. However, is that method reliable enough? Does it work like any other VPNs out there? The answer is – No – it does not. 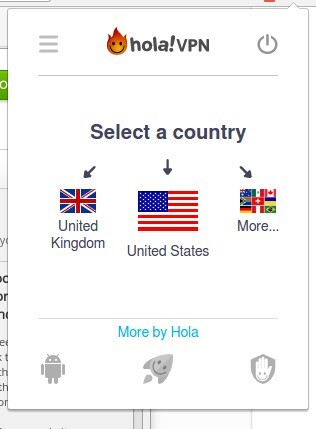 If you are just looking to unblock a specific set of sites, Hola VPN would be a great choice. On the off chance, if you do not like the way Hola VPN works (you do not want to be a peer), you can simply opt for a commercial license of Hola VPN ($5 per month) which whitelists you from being a peer for another user. It is one of the best free VPN for most of the users regardless on which platform they are (Android, Windows, iOS & Mac). You get no restrictions on the data usage with Hotspot Shield but would get access to only 9 of the total server locations. If everything works out for you with the free subscription, you should continue using it because it will not make much of a difference upgrading to the Elite plan. However, we would recommend upgrading to the Elite plan ($29.95 per year) if you want to access more virtual server locations, get priority customer support, ad-free browsing experience, malware blocking, and multi-device support. 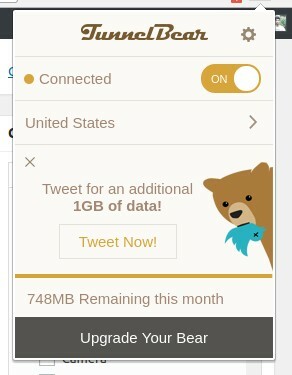 TunnelBear is yet another impressive VPN Chrome extension that you can have installed. It offers a free plan with limited 500 MB monthly data usage, a giant plan for $7.99, and a grizzly plan which costs less per month ($4.16) as it is billed annually. You need to sign up for an account in order to use the service. All of the available server locations will be accessible to you even if you are on the free plan. You will have to pay in order to get an unlimited data usage and priority customer support. Betternet VPN has always been a popular choice among the Internet users who do not like signing up for a VPN service. Well, it is a quite simple fact to understand – how could a company promise zero logs when it requires you to sign up requiring a few details in order to use the service? 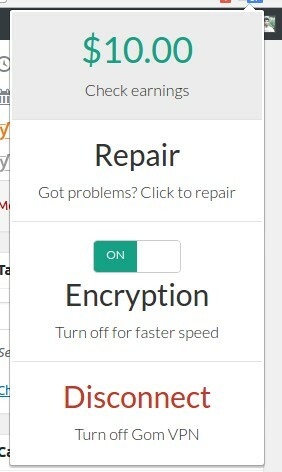 With Betternet VPN Chrome extension, you do not need to set up anything (install it and you are done!). 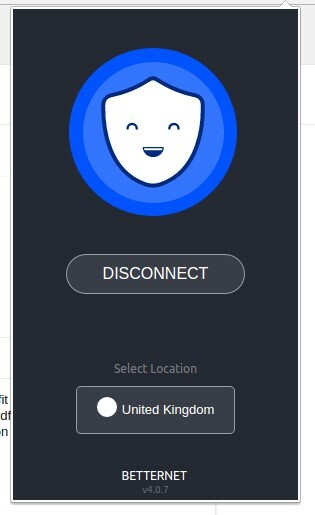 Betternet VPN does not offer much server locations as one would expect (only two of them being – the United States & United Kingdom). 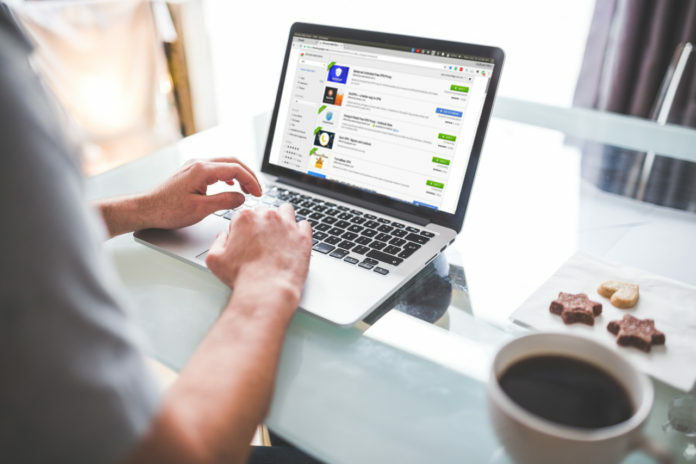 SurfEasy VPN Chrome Extension Recently acquired by Opera, SurfEasy VPN is a recommended solution for users who want a complete premium solution. It would cost you $6.49 per month.However, to start with, it offers 1.10 GB of data usage limit. Moreover, if you are not in a mood to pay for the subscription, you can start referring your friends to earn 500 MB for each referral and continue using it for free. So, now we know about the best VPN Chrome extensions that you can utilize in order to enhance your online privacy. Almost every VPN service out there provides enough security to easily unblock sites and lets you keep your browsing activity hidden from your ISP. In a practical situation, you will have to literally try out each of them if you observe a firewall enforced. Some VPN Chrome extensions may successfully bypass the firewall and some may not. So, it varies from person to person depending on the connection. If you are just using it for your home network or while being connected to a public WiFi hotspot, any of the free solutions like Zenmate, Hotspot Shield, Betternet, and Hola will do the work. However, if you think that you need to have a more reliable and secure VPN service, you can opt for any of the paid plans or paid services like Zenmate Premium, TunnelBear, SurfEasy GomVPN, and DotVPN. in my rss feed and shared it on my Twitter. Thanks again for this great article! What about ExpressVPN and why its never mentioned in the list? Great list admin. keep sharing.